The 41st day of the year; Euler (1772) observed that the polynomial f(x)= x2 + x + 41 will produce a prime for any integer value of x in the interval 0 to 39. In 1778 Legendre realized that x2 - x + 41 will give the same primes for interval (1-40). 41 can be expressed as the sum of consecutive primes in two ways, (2 + 3 + 5 + 7 + 11 + 13), and the (11 + 13 + 17). In 1720, Edmund Halley was appointed second Astronomer Royal of England. Halley succeeded John Flamsteed as Astronomer Royal, a position he would hold until his death in 1742 at the age of 85. 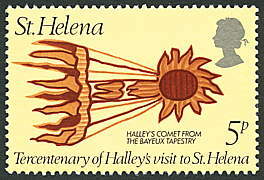 *Wik On the 300th anniversary of his trip to St Helena, the island issued three stamps. The 5p value shows Halley’s comet as it appeared on the Bayeux Tapestry. 1860 Joseph Toynbee (English otologist, whose career was dedicated to pathological and anatomical studies of the ear.) writes to ask Faraday for tickets to Thomas Henry Huxley's lecture. Having been unsuccessful in my attempts to obtain a ticket for Mr. Huxley’s lecture tonight I shall esteem it a favour if you can give me one. 1880 On 10 February 1880, an article ran in the Daily Times (of Bethlehem, Pennsylvania) describing a remarkable invention recently demonstrated by a local inventor, Dr. H.E. Licks. The invention allowed images to be transmitted by telegraph. In other words, it resembled what people today would recognize as a television. However, Licks called his invention a "diaphote," from the Greek dia meaning "through" and photos meaning "light". 1885 Hardy Cross (10 Feb 1885; died 11 Feb 1959 at age 73) U.S. professor of civil and structural engineering whose outstanding contribution was a method of calculating tendencies to produce motion (moments) in the members of a continuous framework, such as the skeleton of a building. By the use of Cross's technique, known as the moment distribution method, or simply the Hardy Cross method, calculation can be carried to any required degree of accuracy by successive approximations, thus avoiding the immense labour of solving simultaneous equations that contain as many variables as there are rigid joints in a frame. He also successfully applied his mathematical methods to the solution of pipe network problems that arise in municipal water supply design; these methods have been extended to gas pipelines. 1576 Wilhelm Xylander (born Wilhelm Holtzman, graecized to Xylander) (December 26, 1532 – February 10, 1576) was a German classical scholar and humanist. 1868 Sir David Brewster (11 Dec 1781; 10 Feb 1868) Scottish physicist noted for his experimental work in optics and polarized light (light in which all waves lie in the same plane.) He is known for Brewster's Law, which relates the refractive index of a material to its polarizing angle (which is the incident angle at which reflected light becomes completely polarized. 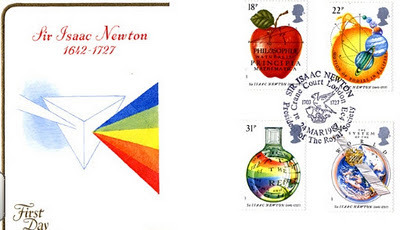 He patented the kaleidoscope in 1817. Later, he used lenses to improve three-dimensional images viewed with a stereoscope. Brewster also recommended the use of the lightweight, flat Fresnel lens in lighthouses. *TIS A nice blog about Brewster is here. 1891 Sonya Kovalevsky (Sofya Vasilyevna Kovalevskaya) (15 Jan 1850; 10 Feb 1891) professor of mathematics at Stockholm. In her youth, her bedroom was wallpapered with the pages of a text from her father’s schooldays, namely, Ostrogradsky’s lithographed lecture notes on the calculus. Study of the novel wallpaper introduced her to the calculus at age 11. She became the greatest woman mathematician prior to the twentieth century. *VFR a Russian mathematician and novelist who made valuable contributions to the theory of differential equations. *TIS She died of influenza in 1891 at age forty-one, after returning from a pleasure trip to Genoa. She is buried in Solna(Stockholm suburb), Sweden, at Norra begravningsplatsen (Northern Cemetery). Alfred Nobel is buried in the same cemetery. 1936 Eleanor Mildred (Balfour) Sidgwick, (11 March 1845 – 10 February 1936) was an activist for the higher education of women, Principal of Newnham College of the University of Cambridge and a leading figure in the Society for Psychical Research. She was born in East Lothian, daughter of James Maitland Balfour and Lady Blanche Harriet. She was born into perhaps the most prominent political clan in nineteenth-century Britain, the 'Hotel Cecil': her brother Arthur would eventually himself become prime minister. Another brother, Frank, a biologist, died young in a climbing accident. One of the first students at Newnham College in Cambridge, in 1876 she married (and became converted to feminism by) the philosopher Henry Sidgwick. In 1880 she became Vice-Principal of Newnham under the founding Principal Anne Clough, succeeding as Principal on Miss Clough's death in 1892. She and her husband resided there until 1900, the year of Henry Sidgwick's death. In 1894 Mrs Sidgwick was one of the first three women to serve on a royal commission, the Bryce commission on Secondary Education. As a young woman, Eleanor had helped (John William Strutt, who was married to her sister, Evelyn) Lord Rayleigh improve the accuracy of experimental measurement of electrical resistance. She conducted several experiments in electricity and with him published three papers in the Philosophical Transactions of the Royal Society. She was a member of the Ladies Dining Society in Cambridge, with 11 other members. In 1916 Mrs Sidgwick left Cambridge to live with one of her brothers near Woking; she remained there until her death in 1936. 1951 George Abram Miller (31 July 1863 – 10 February 1951) was an early group theorist whose many papers and texts were considered important by his contemporaries, but are now mostly considered only of historical importance.